In The Heart of the Matter, Graham Greene takes a fundamentally ordinary decent man down a path that leads to spiritual conflict and despair. Henry Scobie is an assistant police commissioner stationed in a British controlled West African coastal town during World War 2. He’s a man of high integrity although his scruples and his reserved nature have made him something of an outsider amongst the other British settlers. As the book opens Scobie hears he has been passed over for promotion. He is disappointed but for his wife Louise, this news is the final humiliation. For almost 15 years she’s endured the suffocating heat and annual monsoon, the humidity that turns her treasured poetry books mouldy unless wiped daily and the vultures that perch on the tin roof of their home (which is essentially little more than a shack on stilts) She begs Scobie to return home to England or – failing that – for a holiday in South Africa. It’s the beginning of Scobie’s problems. He feels pity for his wife’s plight but can help her only by taking the one step he has vowed never to take – borrowing money from a Syrian trader known for his dubious business practices. It proves a fateful decision when the trader begins exerting pressure on Scobie to turn a blind eye to his diamond smuggling activities. Scobie’s downward spiral accelerates when he falls in love with Helen, a widow almost half his age, the survivor from an attack on a flotilla of ships making its way along the coast. … there are limits to what I can do to you – or them. I can’t desert either of them while I’m alive but I can die and remove myself from their blood stream. They are ill with me and I can cure them. And you too, God – you are ill with me. I can’t go on month after month, insulting you……. I’ve longed for peace and I’m never going to know peace again. I first read The Heart of the Matter more than 30 years ago but never appreciated the power of the novel at the time. I dug it out from the back of the cupboard as part of the ‘Greene for Gran’ readalong organised by Savidge Reads as a tribute to his book-loving gran. And I’m so glad I gave it another go. It’s one of those books where I was completely embroiled in the protagonists’ situation , cringing whenever he took an action that, as an outsider, I sensed would plunge him deeper into a crisis. The atmosphere of decay and rot created by Greene was also perfect match for the way we see Scobie’s integrity, the code by which he has lived his life, gradually become corrupted under the weight of his desire to avoid giving pain to those around him. A superb study of a man in turmoil. 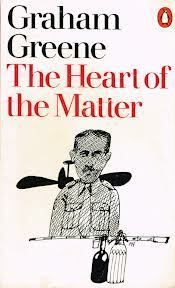 The Heart of the Matter is considered one of Greene’s best even though the author apparently hated it personally. It forms a companion to three other novels (The Power and the Glory, The End of the Affair and Brighton Rock) in which Catholicism and the conflict between an individual and his faith are central themes. Posted on August 31, 2013, in Book Reviews, Classics Club and tagged British authors; Classics, Graham Greene. Bookmark the permalink. 10 Comments. Interesting review: I recently read the End of the Affair and found it very intriguing. I’ll put Heart of the Matter on my to-read list. that one is on my re-read list too..
It’s a great book, isn’t it? I think on balance I preferred The Ministry of Fear, in terms of enjoyment, but the language in The Heart of the Matter is incredible. I haven’t read Greene yet, but I have a copy of this book. I put The Power and the Glory on my bedroom shelf, a shelf reserved for books that I plan to read soon.